DD Form 2947 - also known as the "Tricare Young Adult Application" - is a United States Military form issued by the Department of Defense. The form - often incorrectly referred to as the DA form 2947 - was last revised on November 1, 2012. Download an up-to-date fillable PDF version of the DD 2947 below or request a copy through the chain of command. DESIRED SERVICING CONTRACTOR SHOWN BELOW. For specific information on eligibility, coverage, costs, claims submission, go to: www.tricare.mil/tya. Includes dependents of sponsors enrolled in the TRICARE Reserve Select and TRICARE Retired Reserve health plans. for Active Duty Family Members (TPRADFM). enrolled in TRICARE Overseas Prime Remote. 18. PLEASE IDENTIFY IF YOU ARE CURRENTLY COVERED BY OTHER HEALTH INSURANCE. changes in monthly premium amounts required by law. comments, or concealment of a material fact may be subject to fine and/or imprisonment under applicable Federal law. I am eligible to enroll in an employer-sponsored health plan offered through my employer. based primarily on the 20th of the month rule (applications received by the 20th of the month are effective the first day of the next month). (and PCM assignment for Prime plans) before obtaining routine medical care by calling your contractor. 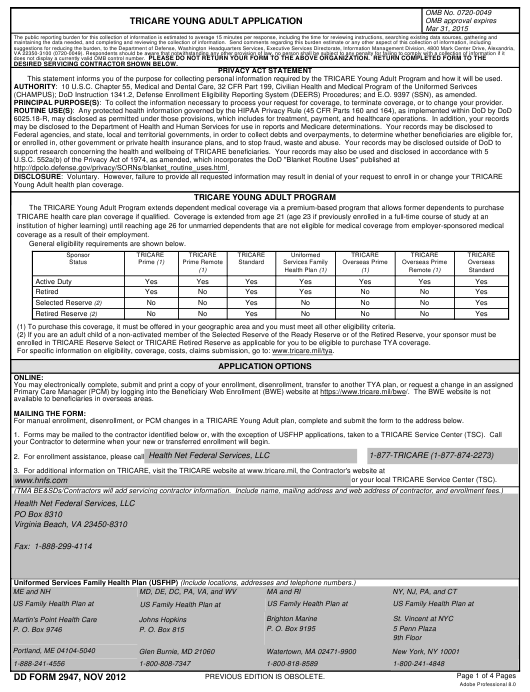 TRICARE Young Adult for 12 months from the date of the disenrollment. PAYMENT OPTIONS: See Section V on the next page. application being returned without action. Use same Visa/MasterCard Credit or Debit Card information used for initial payment of premiums.